I read this article and found it very interesting, thought it might be something for you. 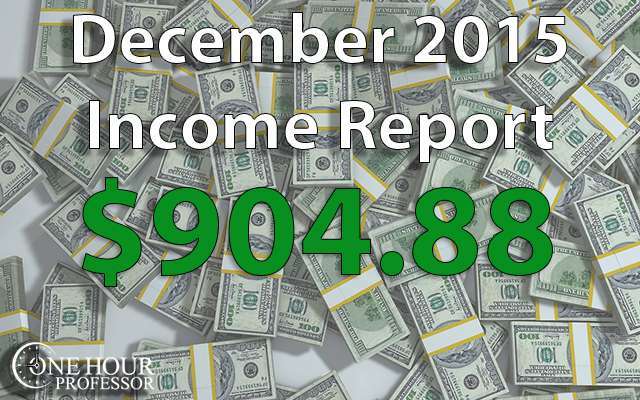 The article is called December 2015 – Monthly Income Report and is located at http://www.onehourprofessor.com/december-2015-monthly-income-report/. Another month and some pretty solid earnings. Things aren’t necessarily perfect just yet with this online business stuff, but things are going a little better as of late and even after being knocked down a few times, I’m still optimistic about what the future will bring. This month I didn’t get as much work done as I would have liked. Most of this was due to the holiday and all of the family/traveling involved, but I was still able to squeeze a bunch of things in. NEW Authority Website: I got finished with my new authority website in December, but I’ve had a really strange result thus far. For whatever reason, even though I have over 550 pages and submitted a sitemap, barely anything is in the Google search engine result pages. In fact, thus far I only see 3 total pages on the Google Search engine and for the first time in a long time, I am stumped. I am considering calling a Google rep directly and seeing if they can help, but for now I am going to wait a few weeks and see if things get fixed by themselves. I can’t spend too much time focused on this website right now because I need to ramp up my consulting gig anyway, but I’ll try to get this fixed. LawyerInternetAds.com: This is my brand new consulting website and I’m hopeful that it will do well. The plan is to get a handful of Lawyers who need Google Adwords help and to get them more business. Lucky for me, I’ve had quite a bit of experience doing this and I am confident I have the skill set to help them, I just need to convince some lawyers that I can help them. So, for now, this is my main focus. 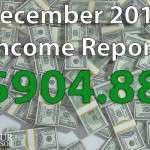 BLOG: November 2015 Income Report: The income report for November was pretty good and took me the typical amount of time to complete. Overall, my income this month was just over $900. All things considered, this was a pretty awesome way to close out 2015 and it was one of my best months from a profitability standpoint. A lot of this is because I’ve reduced my expenses as much as possible and am trying to only spend on things that I know are worth it. MyPerfectResume.com: This is a really awesome resource that I found for JobsForFelonsHub.com, my first authority website. Basically it lets people create their own resume online with the use of some awesome templates and it’s a great service to help those who aren’t trained in creating resumes. The best part? I get paid every time someone registers for the website, not when they buy something…but when they register. Dragon Naturally Speaking Software: I’ve talked about this awesome dictation before, but most people haven’t purchased it yet. I made a commission because someone purchased a copy, and if you haven’t seen how helpful it is yet, you can click here to see my tutorial. Udemy: Just under $20.00 for the month in Udemy, but I’m happy to see it given that I didn’t do any promotion or anything. In other words, this was all 100% passive and that’s something I love to see. Google Adsense: My revenue in Adsense dropped a little bit this month, but traffic was trending upwards on the JFFHub website towards the end of the month. I personally think that January will be one of the best months ever for JFFHub, but we will see what happens. YouTube Channel: Earnings were hovering right around $40 again this month, though I think it could have been the best month yet if the holidays hadn’t interfered. Shutterstock: This month there was an awesome purchase that netted me about $45 from my affiliate partnership. I was excited to see this, a pretty good commission just for having the website up. Indeed.com: A big increase of income from Indeed this month and that’s even with the holidays. I’m really happy to see it and feel like January will be my best month yet, but only time will tell. Consulting: Another good month of consulting as I had a few of my clients request extra work in December. As I said earlier, I want to increase this moving forward and it will be my current focus. Aweber: Typical income numbers on my email platform this month. This is due to people signing up in the past and trusting that this email solution works. Still hasn’t let me done, love this email platform. Expenses this month were pretty low, but I hope to drop them further in January. Hostgator: I still have this hosting cost because I haven’t completely migrated to Siteground, but I am ALMOST done. My developer has been a little slow at this and made a lot of mistakes which is irritating, but we are almost done. Fiverr: I spent $15 to get some logos made for the new consulting website. I’m happy with what it ended up at, great place to find cheap logos of high quality. I suggest that if you go this route, buy 2-4 logos from two different providers. You’d be amazed at what you can get for the price. Call Rail: This is the platform that I’ve been using to record my client calls for my paid search consulting gigs and if I’m able to do what I need to do. Upwork.com: Again, an area where I spent a lot of money this month. Most of it was for paying for writing services and development work for migration as well as some research. The new website is up and ready to go. It’s been a little slow thus far with traffic, but hopefully that changes soon. My consulting website is about 95% done. The only hold up is I am waiting for a video editor to complete some things and will post them soon. I have some good ideas for getting my consulting clients, but before I even start I need to get the videos done from my freelancer. I’m waiting on my freelancer to complete the videos, but I want to make sure this website is done completely by mid January. Hopefully this happens soon, my hands are tied at the moment. By the end of January, I’d like to have at least one new consulting client by using my new website and paid search methods as well as anything else that helps me get new clients. I’m being very careful with my costs lately because I haven’t been making enough money and need to make sure I consistently deliver a profit each month. You have over 550 pages on a site but only 3 indexed? Something seems weird there. How long has the site been live? One thing you can try is to download a plugin called “Google XML sitemap for videos” and use that to ping Google. I use this plugin all the time to index my PBN sites and it works like a charm. Just make sure that you have a video somewhere on your site for it to work. Let me know how this works Ron! Thanks for chiming in. I was able to fix it. The problem was that I inserted the GA code near the top of my header when I should have put it right before the closing tag. Didn’t know it makes a difference, but apparently it does!